Microsoft caught many people by surprise yesterday when it jumped into the wearable technology arena with the launch of Microsoft Band, a health and productivity device, which is worn around the wrist like a watch. Microsoft joins a crowded field, which includes the likes of Jawbone (UP24) and Fitbit (Flex and Zip), and which will soon see the arrival of Apple Watch. Although heavier than most of the existing tech-inspired wristbands, Microsoft Band is sleek-looking and stylish, blending a heavy-duty rubberized strap with a black horizontal screen that lights up with a full-color display when activated. Although Microsoft Band is currently only available in black, there are three different sizes to fit even the largest or smallest of wrists. Microsoft Band comes pre-charged, so you can use it right out of the box, but there is also a charging cable that snaps onto connectors on the inside of the wristband and plugs into a standard USB adaptor. When fully charged, Microsoft Band will last 48 hours with normal use, although activating features like GPS will inevitably cut into the battery life. Once Microsoft Band is turned on, you can customize the color of the screen and also the background wallpaper. If you have one, you can sign in to your Microsoft account to populate your profile fields or you can enter them manually. 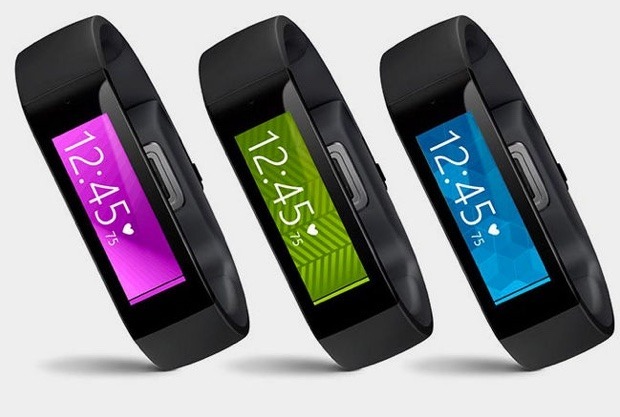 Microsoft Band is compatible with iOS 7.1 and 8, Windows Phone 8.1, and Android devices running 4.3 or later. I had a few problems pairing Microsoft Band with my Droid MAXX, as both devices wanted me to input different PINs, but they got on the same page after a few tries. As with most other Bluetooth devices, once you connect the first time they recognize each other and pair automatically after that. Microsoft Band offers an impressive set of features, including built-in GPS, call-screening, the ability to read incoming e-mails and texts, a fully-synced calendar, a heart rate monitor, and more. But the key to making the most of Microsoft Band is Microsoft Health, an ambitious and superbly organized wellness app, which offers a wide selection of health and fitness tools. With Microsoft Health you can set activity goals, monitor performance, track your heart rate and sleep patterns, choose from a wide range of different workouts, and even map your outdoor runs. The developers of Microsoft Health have clearly paid close attention to all the popular sports apps and have produced a winning combination of all the best features. At $199, Microsoft Band is considerably more expensive than Jawbone’s UP24, the Fitbit Flex, or Nike’s Fuelband, but none of those devices can really compare with the style and functionality of this excellent new device. Microsoft may have been a late and unexpected arrival in the world of wearable technology, but now they are here they have undoubtedly raised the bar for everyone else! Tuesday, November 18: A Special WWEmoms Twitter Event! Join @WWEmoms and co-hosts @Kmart and @KmartDeals TODAY at 12 pm CT (1 pm ET) as we celebrate WWE and enjoy Shop Your Way exclusives at Kmart! RSVP and attend the party for a chance to win one of four $50 Kmart Gift Cards! I agree with the above quote, and the more we embrace technology, the more we can help rescue the millions of dogs and cats that are cared for by shelters each year! 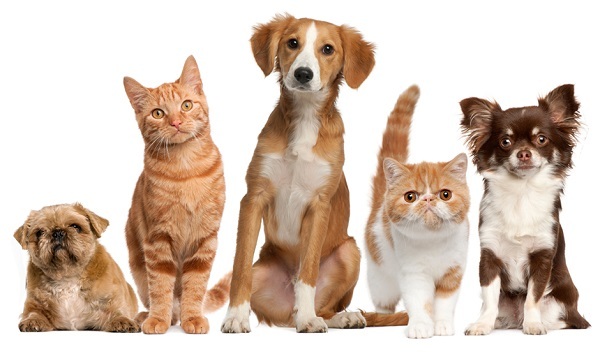 Considering that microchips and animal tattoos are becoming outdated and tags can be lost, it is exciting to see the growing use of technology and social media to help re-unite lost pets with their owners, as well as find loving homes for shelter animals. businesses about lost pets in their area. I reflected upon the huge value that this service offers. Here, sharing details with the masses was an animal recovery service that has helped 1000s of owners find their lost pets! Another growing lifeline is the PiP My Pet app for iPhone and Android. PiP helps pet owners locate their furry friends by using facial recognition technology. Anyone with a smartphone can take a photo of a found animal and check the app’s database to see if it has been reported missing. The app’s facial recognition engine is reported to have between a 95 and 98 percent success rate. PiP is making arrangements with a number of U.S. counties that would share data and images at no cost to lessen the number of pets that end up in shelters. Using similar technology, PetMatch (iOS and Android) helps connect people with a pet they want to adopt by searching through the PetFinder database. Looking to adopt a terrier, for example? Take a photo and the app will use the image to find a similar-looking dog in your area that is ready for adoption. Some shelters have developed yet another brilliant way to rescue pets! iPet Companion allows viewers to view and “play” with animals available for adoption through a live video feed. Users get to play for two minutes, maneuvering the camera to see the animals and clicking on toys to interact with the kitty or puppy of their choice. Pet rescue and adoption is now easier, thanks to our handheld devices, apps and high-speed Internet access. GPS devices are also growing in popularity. We must also give props to social media for creatively highlighting the efforts of shelters and rescue services! Twitter and Facebook posts of available pets are very visually powerful images. Just this past summer, a Facebook friend, Lisa, posted a picture of the dog that my family had been waiting for and thanks to her efforts in support of AlmostHomeAnimalRescue we now we have an adorable 22 pound Yorkie! Social platforms are ideal for business owners like Lisa to not only gain exposure themselves but to partner up with humanitarian services. All part of a noble effort to help save lives and build memories, one precious fur ball at a time! When Tim Cook, Apple’s CEO, unveiled Apple Pay amid huge fanfare back on September 9, it was hailed by many observers as a watershed moment for mobile payments: an app that would finally convince a skeptical public that using a smartphone to pay for everyday goods and services was simple, efficient and, above all, secure. And despite some early hiccups, most notably with Bank of America, the rollout of Apple Pay has gone relatively smoothly, until now that is. This week, two of the nation’s largest drug stores, Rite Aid and CVS, pulled the plug on Apple Pay and joined other high-profile retailers, including Walmart, Target and Best Buy, in de facto announcing that they wouldn’t support Apple’s payments initiative. To be fair, the retailers, which are part of a group called Merchant Customer Exchange or MCX, did not directly announce a boycott of Apple Pay. Instead they disabled the Near Field Communications (NFC) sensors at their checkout stations, which the Apple Pay software on an iPhone 6 relies on to be able to communicate with the cash register. Apparently, MCX is supporting its own mobile payments system, known as CurrentC, which is not expected to be available until 2015. It appears that MCX members didn’t want Apple Pay to establish too large a footprint in the mobile payments marketplace before CurrentC had a chance to compete. The fact that MCX retailers are rebelling against Apple Pay is not surprising. A non-cash transaction at any store has to satisfy three different parties with three different priorities: the customer, who wants a simple, quick and safe payment method; the retailer, who wants the same as the consumer but who also wants to be able to collect data on buying habits and more; and finally, the financial institution that stands behind the transaction and wants to make sure it gets its cut. As is usually the case with Apple (see music, books, apps and more), it has developed a potentially revolutionary system that conveniences the consumer but doesn’t do quite so much for the other parties to the transaction. In particular, it’s hard to see how the stores benefit from Apple Pay. One of the big selling points for the consumer – the lack of any traceable data – is actually a big problem for the stores, denying them the opportunity to track the buying habits of their customers and institute loyalty programs and other incentives. But perhaps the biggest problem for the retailers is that it locks them into the same old fee-paying relationship with the banks. In an industry where margins are often razor thin, retailers have long objected to the 3 – 5 percent that they have to shell out for credit card transactions. One of the most attractive features of CurrentC from the retailers’ point-of-view is that it is expected to connect directly to a customer’s bank account or to a store-specific credit card, eliminating those fees altogether or at least keeping them in-house. If Apple is expecting a wave of consumer resentment to force the MCX retailers to change their minds, it might be disappointed. The biggest problem facing a viable mobile payments system to this point has been consumer inertia and that isn’t expected to change anytime soon. 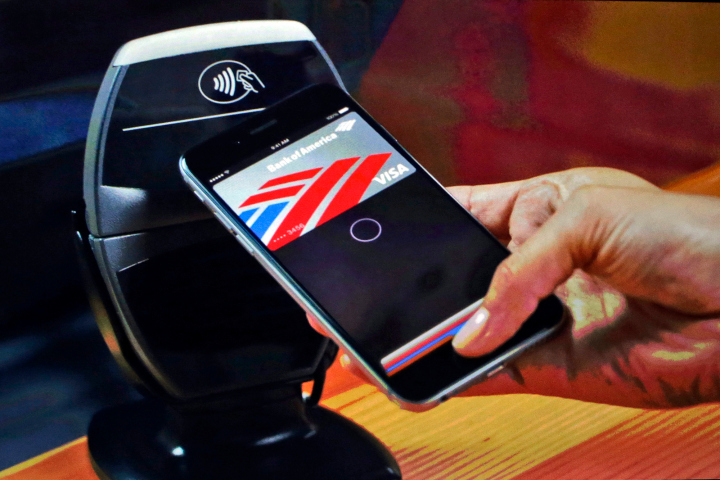 Although Apple claimed that over 1 million credit cards were linked to Apple Pay in the first 72 hours of launch, that represents just a tiny fraction of the more than 1.8 billion credit cards currently in use in the U.S. And, as many people have pointed out, Apple Pay only works with the iPhone 6, further restricting the potential backlash to a small, albeit extremely vocal, group of consumers. As Apple has demonstrated many times in the past, it is happy to weather a slow adoption period in order to achieve a dominant position further down the road, and the company does have a history of persuading consumers to buy into something that they didn’t think they needed. However, asking Americans to get excited about a mobile payments system that they have doubts about in the first place is a particularly hard sell. Without the support of the retailers, it becomes nearly impossible. Vehicle crashes are the leading cause of death among American teenagers, claiming nearly 3,000 lives each year. * That sobering statistic is why we are so conflicted when it’s time for our teens to climb behind the wheel of a car: we love the thought of them growing up and gaining more independence, but we hate to think about the risks. Fortunately, motor vehicle manufacturers are taking teen safety very seriously, and one of the pioneers of safer teen driving is Ford. But Ford’s contribution to safer teen driving doesn’t stop with improved training and messaging. The Ford MyKey in-vehicle security system allows parents to configure various on-board features to enhance safety and reduce or eliminate distractions. Using a programmable key, parents can mute the audio system until the front seat belts are engaged; limit a vehicle’s top speed; ensure certain safety settings can’t be deactivated; and remotely control the volume of the radio. By setting a tough “no distractions” rule, parents can help teens keep their hands on the wheel and their eyes on the road. A co-worker of mine who has just made herself the target of my next April Fools’ prank reminded me the other day that there are only 9 more Fridays between now and Christmas. Good grief. My family draws names with our extended families, so I don’t have a lot of people to buy for, but the older we get and the more settled we all are, the more challenging gift-giving can be. We all enjoy our tech, but finding gifts that come in under budget and are worth spending the money on can be tricky. Here are a few suggestions to ease that “How many weekends until Christmas?” panic – all under $100. The Google Chromecast allows you to stream videos, music and photos to your TV via your smartphone, laptop or tablet. About the size of a USB device, it’s easy to install and use. 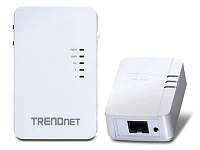 Simply plug it into your TV and connect to your wireless network. Compatible with Android and iOS platforms, you can stream services like Hulu, Netflix, YouTube, Plex, HBO Go, Pandora, ESPN, MLB.TV, Google Play, Crackle, Rdio and several others. 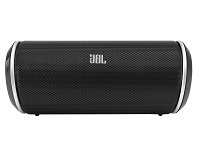 It’s listed at $35 but several places online like Amazon and Walmart offer it for less. 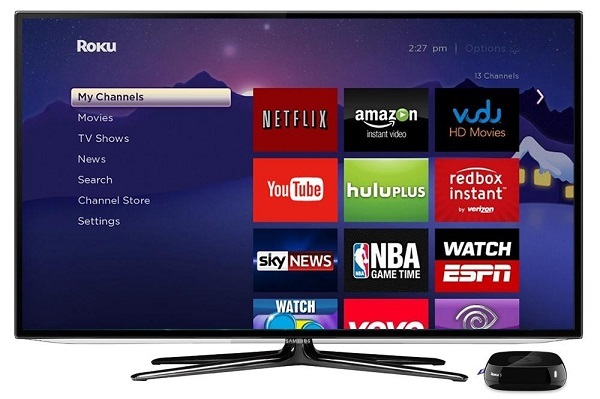 The Roku 3 is Roku’s fastest and most powerful streaming device yet. Toss your cable or satellite subscription and watch Netflix, Amazon Instant Video, Hulu Plus, Vevo, Spotify, and PBS Kids, as well as an additional 1,500+ channels for free. About the only thing missing is iTunes – you’ll need Apple TV for that. Roku also offers a free app on iOS and Android and you can stream videos and music from your smartphone or tablet to your HDTV. There’s no subscription fee for Roku, but you will need to provide credit card information during set up should you want to purchase content from the Roku Channel Store. Roku even offers gaming options like Angry Birds Space and Jeopardy, and features a motion sensing remote with game ready buttons and games. MSRP: $99.99. If you’re on a tighter budget, there’s the Roku Stick. It doesn’t offer all the same features but at half the price it’s still a great option for streaming TV. The Kingston DataTraveler SE9 storage drive has a metal casing tough enough to hang out on your key chain and comes with a five-year warranty and free tech support. It’s smaller than a house key, capless, and supports Windows 8, Vista, XP & Mac. The SE9 features 4 different storage capacities, from 8GB to 64GB. 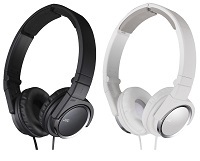 Plus, you can’t beat the price: the SE9 starts at around $8, increasing to just $28.95 for the highest capacity model (current Amazon prices). Join @theonlinemom @RobynsWorld @geekbabe and @thetechdad TODAY at 12 noon PT (3 pm ET) as we chat about The Smart Home! 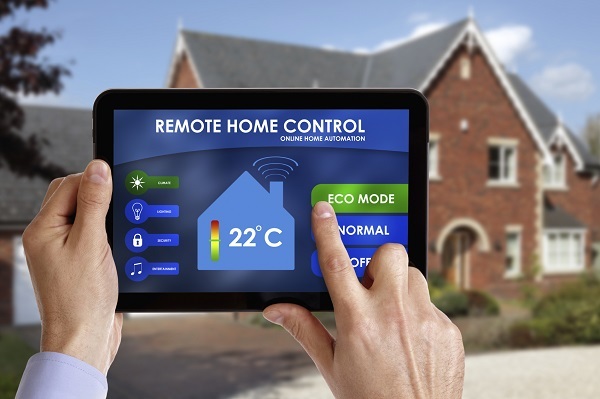 Faster networks and smarter apps have produced a whole new generation of connected devices for the home, including Bluetooth speakers, security cameras, smart thermostats, and more. We look at how these devices are changing the way we live, and explore the future possibilities for this rapidly expanding sector of the mobile lifestyle. RSVP and attend the party for a chance to win a Dropcam Pro HD camera or a Samsung Galaxy Note 4 smartphone! And join the Video Recap right after the chat for another chance to win a Samsung Galaxy Note 4! I happened upon a robust conversation about how libraries, as we know them, are evolving. Similar to how brick-and-mortar book stores have been closing down due to competition from online retailers like Amazon, maybe public libraries, one person suggested, might end up going the same route. Others piped in, remarking that the means we use today to access other services and resources will inevitably have a long term impact on libraries. While the gradual reinvention of the public library will not eliminate physical books entirely, there is a clear trend towards incorporating more technology in the support of accessible literature. Libraries are becoming multi-media meeting places rather than merely clearing houses for lending books. In a study released last year, the Pew Internet & American Life Project asked Americans about how they use libraries and what they want to see changed. The study showed that despite the various ways we can now access reading material, people still very much value the physical library, particularly those who lack experience with new technology or don’t own the latest gadgets. 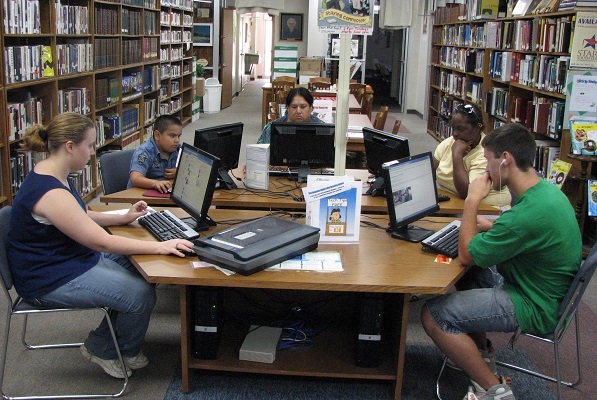 91% of Americans ages 16 and older say public libraries are important to their communities. 76% say libraries are important to them and their families. 58 percent of people surveyed would be likely to checkout e-readers already loaded with books. 77% say free access to computers and the Internet is a “very important” service of libraries. 51% would take classes on how to use devices like the Kindle (Pew says this demonstrates “significant growth” from the prior year). 63% are interested in apps-based access to library materials and programs. New practices are popping up, which are extensions of the traditional library services: Redbox-style lending machines or kiosks that allow people to check out books, movies or music without having to go into the library itself; Amazon-style book, audio and video recommendations based on patrons’ library behavior that encourage return visits; and – I get a kick out of this one – GPS-navigation apps that help patrons locate material inside library buildings. (Be sure not to text while “driving!”). Of course if you are just looking for e-books, you may not need to visit the library at all. Google Books and iTunes are just two of the many resources for finding free e-books online. The Holiday season is fast approaching and group photos are always a must. But think about how many group photos you have taken that are actually flattering – probably not that many. However, there are a few basics things we can do to get better group photos, even if we are only using a smartphone. 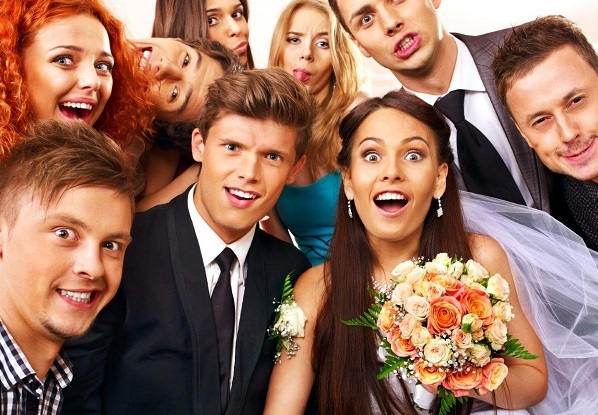 Here are six tips to improve those group shots. Too often we try to get everyone’s entire body into group shots but in doing so we lose the detail of their faces. Get closer to your group and just worry about including faces rather than full bodies. There are several apps and programs available that let you merge the best parts from multiple photos into one. It is inevitable when you take group shots that someone will be blinking or frowning resulting in an unflattering look. If you take several shots of your group, you will have the ability to get the best of everyone in the final edited photo. Many smartphone cameras now offer “burst mode,” which automatically takes multiple photos to help you capture the best shot. Try to find a way to get up higher to take the group shot. Look for a mound, steps, or sturdy furniture to stand on. This gives you a different perspective on the group. Plus shots from above are generally more flattering. Go ahead and take the standard picture of everyone looking ahead and smiling but then mix things up a bit. I personally like to have everyone make silly faces for at least one photo. Think about action shots as well, like jumping up in the air. Outdoor settings generally offer the best lighting. Just make sure you are not in bright sunlight, which can make people squint or cause harsh shadows. If you are inside, try finding a spot next to large windows to let in natural light. While the people are the most important part of a group photo, backgrounds can be important too. If we don’t think about the background, we can end up with a cluttered and distracting setting. Look for simpler backgrounds, like blank walls and other plain backdrops.